Search by the name of the Proposal or proposal ID. Just type in the search field and a list of suggestions will pop-up with relevant terms. Clicking on Search presents results in a table, depicted below. Figure 1. Image shows the search results within Proposals by keyword "oxidation"
Proposal Names link to corresponding portals. 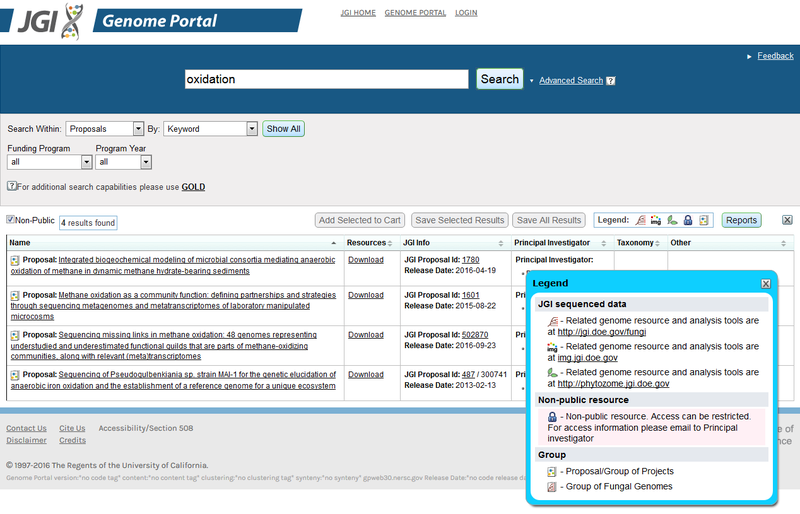 Click on a JGI Proposal Id link to go to the corresponding info page with a list of pProjects underneath. Click on a Principal Investigator name to e-mail the P.I. for this proposal. The funding program refers to the specific user program or call for proposals that the work was approved under. Specific categories are listed below in more detail. The Department of Energy has established three Bioenergy Research Centers (BRCs) to use genomics to accelerate the production of cellulosic biofuels from biomass. The three BRCs are BioEnergy Science Center (BESC), Great Lakes Bioenergy Research Center (GLBRC) and Joint BioEnergy Institute (JBEI). Some work has been supported by all three of these centers, designated as BRC-Multi. The Community Science Program is JGI’s main user program. The CSP designation includes proposals submitted through the CSP annual call, the CSP microbial/metagenome small-scale call and DOE’s Low Dose Radiation Research Program. Now known as JGI-EMSL Collaborative Science Initiative, this program supports proposals using both JGI’s sequencing and EMSL’s proteomics resources. Director’s Science represents a set of discretionary projects approved by the JGI Director. This category of proposals includes proposals from DOE-supported legacy calls including DOE Microbial program (DOEM), Laboratory Sequencing Program (LSP), and International Cooperative Biodiversity Groups (ICBG). The Emerging Technologies Opportunity Program (ETOP) represents proposals from the scientific community in partnership with the JGI. R&D proposals are primarily for new JGI technology development. Synthetic Biology proposals represent sets of constructs that have been synthesized at the JGI. Program year represents the calendar year when the proposal was reviewed by JGI, with the exception of CSP Annual and CSP-EMSL proposals, where the year corresponds to the call year.